As you can see our first attempt was mediocre at best! was hosting a Sushi 101 media event at Ra Sushi where attendees would learn how to roll sushi we knew we had to go! 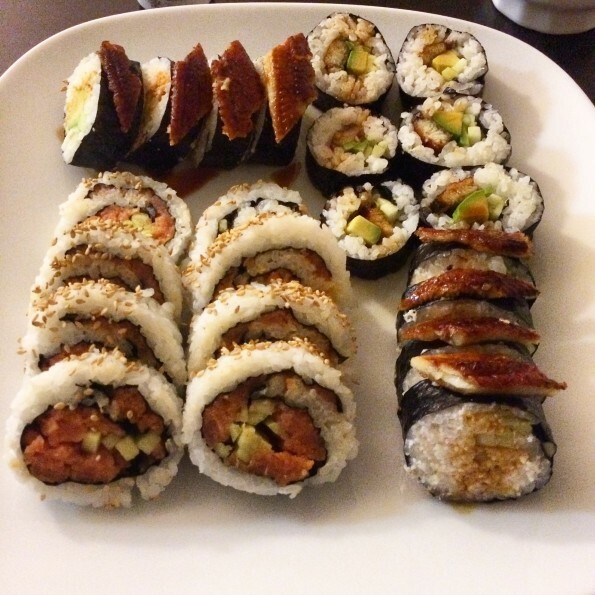 We had tried to do our own Sushi Date Night at home and our results were okay but not great. It also took us all night! This could only help us get better at rolling sushi right? Sushi was originally made as a means of preservation and as it evolved the fermentation lessened. Sushi rice being made with vinegar is a way of honoring sushi’s fermentation past as well as the favor. Sushi is actually meant to be eaten with your hands. Rice is the most important element when it comes to preparation. Rice is washed the night before. Good quality sushi rice should stick together but you should be able to notice each individual grain. It shouldn’t be too dry, too mushy or too pasty. You don’t want to over fill your rolls. For a standard roll you should use about 3 oz of rice, 1 oz of filling and whatever vegetables you are adding. Vegetables should not be put on top of the filling, but rather on the side. Roll by hand and then shape with the bamboo mat (this is where we went totally wrong in our first at home Sushi Date Night). With all of these tips and skills under our belts, Chef Felipe guided us through making a California Roll, Salmon Nigiri, and a Tootsy Maki Roll. We had a blast making them and surprisingly they didn’t look too terrible! If you are interested in participating in a Sushi 101 class at Ra Sushi sign up for their Hook Up Newsletter to find out details about when the next class will be held in your area. *This was a hosted event put together to facilitate this write-up; however, our opinions are wholly our own. View our Disclosure Policy for more info.